It is sometimes reported that Social Security's current costs exceed its revenue, but if that happened, we wouldn't need a report to tell us. The whole country would know, because 59 million beneficiaries would not get their earned benefits as they now do every month. By law, Social Security can only pay benefits if it has sufficient revenue to cover every penny of costs - administrative as well as benefit costs. The claim that Social Security is running a deficit counts only Social Security's income from its premiums, often called payroll contributions or taxes, and disregards one or both of its other two dedicated sources of income: investment income and dedicated income tax revenue. As Figure 1 shows, when income from all of Social Security's revenue sources is counted, Social Security ran a surplus in 2014. 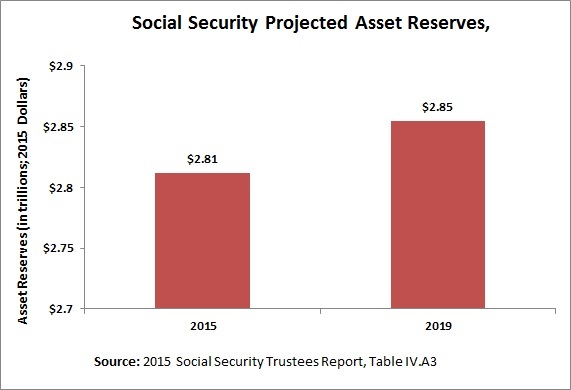 Social Security is projected to run a surplus again this year. And next year. And the year after that. And the year after that. 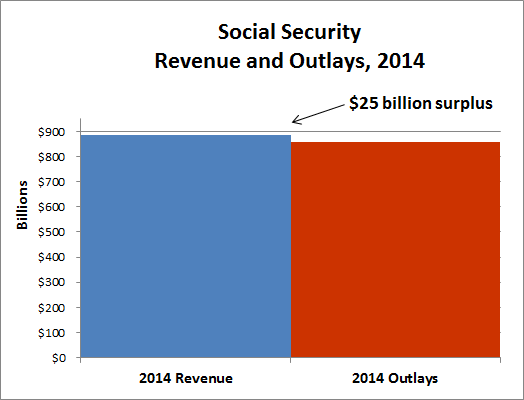 As Figure 2 shows, Social Security's annual surpluses simply add to its large and growing accumulated surplus. Over the next 5 years, Social Security has sufficient funds to pay every penny of benefits and every penny of associated administrative costs. That is true for the next 10 years. And also the next 15 years. Over the next 25 years, Social Security is projecting a modest shortfall of just .51 percent of GDP. Over the next 50 years, the projection is just 0.8 of GDP. And over the next 75 years, the shortfall is projected to be just 0.96 percent of GDP. Let's put those percentages in perspective. Military spending after the 9/11 terrorist attack increased 1.1 percent, of GDP. Spending on public education nationwide went up 2.8 percent of GDP between 1950 and 1975, when the baby boom generation showed up as school children. The fact is that, as the richest nation in the world at the richest point in our history, not only can we afford the current levels of Social Security protections, we can afford to greatly expand Social Security. At its most expensive, in 2035 when all baby boomers are all over age 70, and indeed at the end of the 21st century, we are projected to spend considerably less, as a percentage of GDP, than Germany, France, Japan, Austria and most other industrialized countries spend on their counterpart programs today. It is time to expand Social Security. Social Security's benefits are modest and don't cover a number of eventualities, such as parental leave and sick days, which the Social Security programs of other countries cover. It is time to bolster the economic security of America's working families. Social Security is a solution. It is a solution to a looming retirement income crisis where most workers will be unable to retire without a drastic reduction in their standards of living. Social Security is the most universal, secure, and efficient source of retirement income that we have, providing a guaranteed, inflation-protected source of income that one will never outlive. And, expanding Social Security helps more than retirees. Because disability and survivor benefits are derived from the same benefit formula, increasing its benefits automatically improves the income of non-aged workers and their families. Adding new benefit protections, such as paid family leave and paid sick days would do even more. Virtually all politicians have expressed concern about growing income and wealth inequality. Expanding Social Security and requiring millionaires and billionaires to pay their fair share will begin to put brakes on this dangerously and rapidly growing upward redistribution of wealth. Although today's Congress does not seem likely to expand Social Security benefits, the Democrats could force their hand. Though one single payment is deducted from paychecks for Social Security, its revenue is divided into two separate trusts. From time to time rebalancing is required. One would think that Social Security trustees have the authority to do this simple rebalancing themselves. But that is not how the law works. Instead, rebalancing requires an act of Congress. The Trustees Report once again projects that Congress must act before the end of 2016 to rebalance Social Security's trust funds. If that is not done, Social Security's disability benefits will be cut by around 20 percent. Rebalancing should be routine and has been so in the past. However, today's Republican leaders have already made clear, through a rule adopted on the very first day of the new Congress, that they plan to hold rebalancing hostage this time around. Presumably, they are seeking a bipartisan deal, worked out behind closed doors, that cuts Social Security and enacts other unpopular changes. Instead, the Democrats should hold firm for winning policy and politics. They should propose enactment of one of the many Democratic bills which expands Social Security. For example, The Social Security Expansion Act, sponsored by Senator Bernie Sanders (I-VT), expands benefits in important ways while ensuring that all benefits, including disability insurance benefits, can be paid through 2065. The Social Security 2100 Act, introduced by Representative John Larson (D-CT), expands benefits while ensuring that all benefits, including disability insurance benefits, can be paid through 2090. Indeed, 43 Senators and 116 House members are on record in favor of expansion, in conjunction with ensuring that the wealthiest among us at long last pay their fair share. Expansion is excellent policy. It is extremely popular. It solves many challenges - including the upcoming, manufactured crisis occasioned by the simple need to rebalance. If Democrats are smart, they will make this an issue in 2016 and smoke out their Republican opponents. Since the Trustees Report tells us that Social Security legislation must pass before 2016, Democrats should force Republicans to choose. Republicans in Congress can join with Democrats, backed by the majority of Americans, including their own base, in expanding Social Security. Or Republicans can seek to use their majority in Congress to enact the ideologically-driven, irresponsible and unpopular effort to undermine this bedrock of working families' economic security. Social Security is a solution to our looming retirement income crisis, the increasing economic squeeze on middle class families, and the perilous and growing income and wealth inequality. In light of these challenges and Social Security's important role in addressing them, the right question is not how can we afford to expand Social Security, but, rather, how can we afford not to expand it. Nancy Altman, author of The Battle for Social Security: From FDR's Vision to Bush's Gamble (John Wiley & Sons, 2005) is president of Social Security Works and Chair of the Strengthen Social Security Coalition. She is co-author, with Eric R. Kingson, of Social Security Works! Why Social Security Isn't Going Broke and How Expanding It Will Help Us All (The New Press, 2015), and has written the forward to a new release of Thomas Paine's Agrarian Justice.